Working in the garden this afternoon I needed to stop what I was doing to take some photographs of a local species of parrot, the Australian Ringneck (also called Mallee Ringneck). I did not have to go looking for the bird in question. It was almost like it came looking for me! It flew right up to me in our plant nursery and sat on a nearby branch, not more than 3 metres away. Of course, the camera was in the house, so I tried to casually walk into the house hoping that the ringneck would stay there. It didn’t but flew to a tree some 50 metres away. I continued working, all the time watching for the bird to return. I didn’t have to wait long. It settled in a tree near the house. I quietly went inside with the camera, planning to use our sun-room as a hide. We have three bird baths about six metres from a large picture window. We have had hundreds of very enjoyable meals watching the parade of birds coming to drink or bathe. Again, a very “good” waste of time, being very relaxing and enjoyable. Today’s visitor was taking quite a deal of interest in the water. After taking some good photos through the window I decided to go outside and see how close I could get to the ringneck. I was able to get to about 3 metres away while the bird came down to the bird-bath and proceed to have a very thorough bath. I managed to get several more excellent photos. I then pressed the video button on the camera and filmed the bird washing and preening for about two minutes. I haven’t yet worked out whether I can make this video available on this blog. 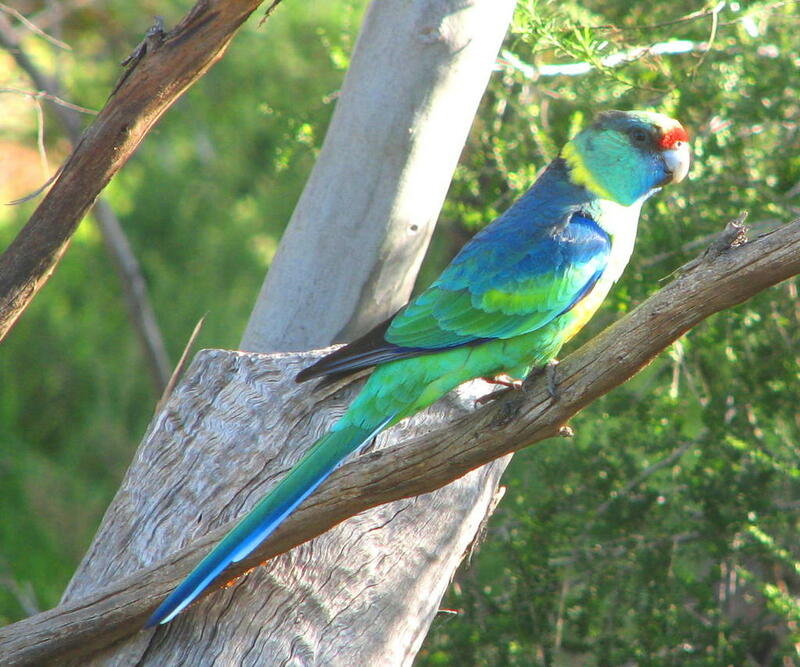 Usually we have only two Australian Ringnecks around in the garden. In recent months there have been four, two of them juveniles. They aren’t in our garden constantly but rather roam over a wide range of the local environment. We usually love seeing them near to the house like today. When they decide to raid the orchard and nip the buds off the pear and apple trees we get just a tad annoyed – no – angry. We also get no fruit! Today I observed only one bird; I wonder if the other is nesting somewhere? 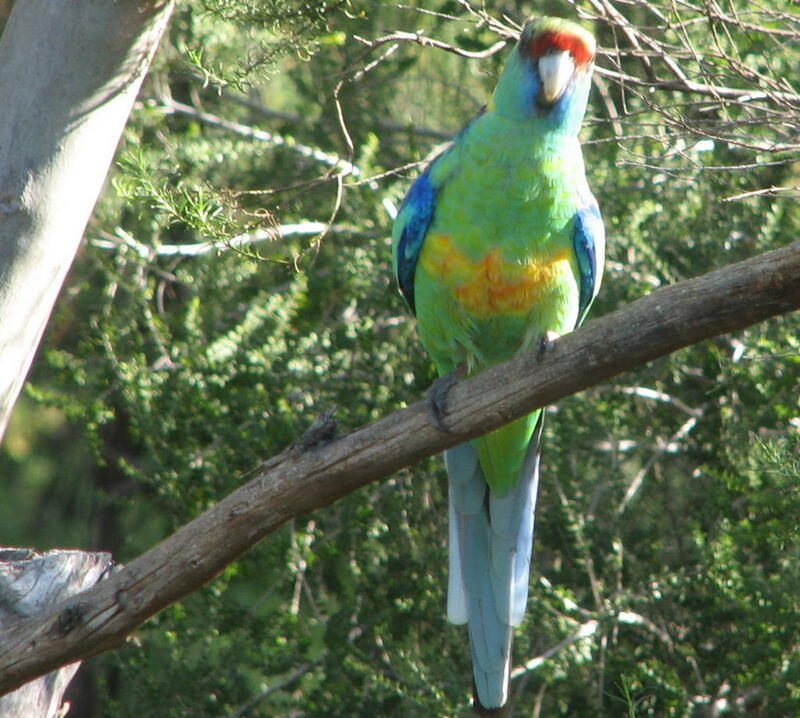 I live in Briar Hill Victoria and found 2 Australian Ringnecks looking for food. What do I do for them. Hi there Ida, Thanks for visiting my blog. I try to add a new post every day so I invite you to return often. Also have a look at my photo gallery for bird photos. You are lucky to have Ringnecks near your home. 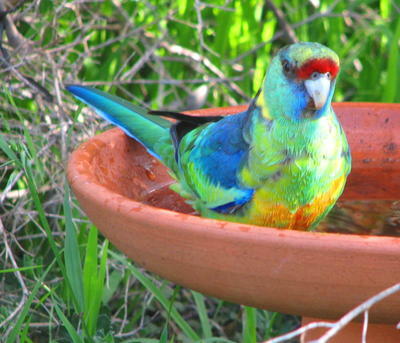 Do you have bird baths in your garden? This is an excellent way of attracting, and keeping, many different kinds of birds near where you spend a lot of time. The Ringnecks may be looking for food but I would be reluctant to put any out for them. Many Australian trees and bushes are flowering at the moment and there should be enough to sustain them. If you feel you would still like to put out food, try a few pieces of cut up fruit such as apple. You may also try some parrot mix from the local pet supply outlet. Something like sunflower seeds would be good. This should ideally be in a feeder with a roof or be placed in a position out of the rain. The main argument against putting out food for any native birds is that they could become dependent on the free food and stop searching for natural food. When you are away on holiday, or forget for a few days, they could suffer as a result. You might also like looking in the local library for books on attracting birds to your garden – some authors call it “birdscaping” the garden.